A lovely complex nose. Light honey floral. Buttery and creamy. Vanilla. Confectionary sugar. Citrus. Lemon peel. Fruit cake mix. Spicy sultanas. Cinnamon. Light Pepper. Boiled oranges (I’ve boiled oranges for an orange cake before and it’s reminding me of that!). A little time in the glass and more spicy sherried fruit notes come to the fore. Spiced caramel. Milk chocolate, even fruit and nut chocolate bar. Definitely a woody nutty character coming forward as well. With a slight hint of waxy polish in the very background. More time and more chocolate and light complimentary spices. The nose is absolutely glorious. Sweet, honey, milk chocolate. Crunchie bars. The development then edges towards the sherry influenced spices, rum&raisin, fruitcake notes, but then more chocolate. Saucepans full of melted chocolate and caramel with Christmas spices. Very smooth, the age has definitely softened this sweet delicious dram, as quite frankly it feels nothing like the 53.3% ABV. Chocolate, sweet caramel, sweetness all the way to the very end, with a little bit of pepper and some oak shavings. I don’t want to! But I will add the tiniest of drops as it’s an old Whisky, and we all know that little water is more with these older drams. The nose now has more balance with the spices on an equal level to the chocolate. The sherry spice notes are there in the background as with the oak age. The palate is a little maltier and creamier now, less chocolate, and more malted chocolate milk shake, with whipped cream. Yummmm. The finish is longer and a lot spicier with pepper and Christmas spices in abundance, still with the chocolate, but nothing like the undiluted level. There is now a drying oak note in the final finish. Fantastic stuff. Absolutely incredible, deep complex nose, which I could sniff for eternity. The palate is the creamy chocoholics dream, and that goes right through to the finish. Amazing stuff, absolutely love it. 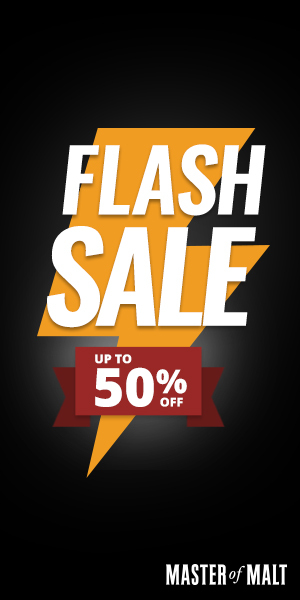 It’s richer in price, but damn rich in flavour. 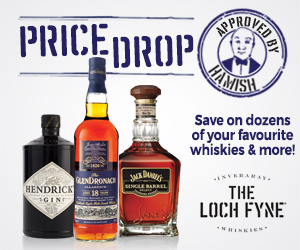 If it’s in your price range and you can find it then it’s a must dram! Massive thanks to Douglas Laing Co. for providing a sample. Further to our press release from last week, I am delighted to inform you that we have since been awarded four medals from the San Francisco World Spirits Competition 2014. Regarded as one of the most respected spirits competitions in the world, the competition saw our products evaluated by top spirits professionals on a blind tasting basis. We are understandably delighted to be scoring consistently high in our industry’s esteemed awards competitions reflecting the consistently high quality whisky we produce. 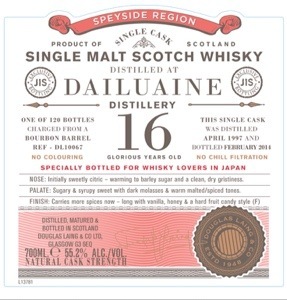 This is the first time I’ve tried a Whisky from Dailuaine distillery. 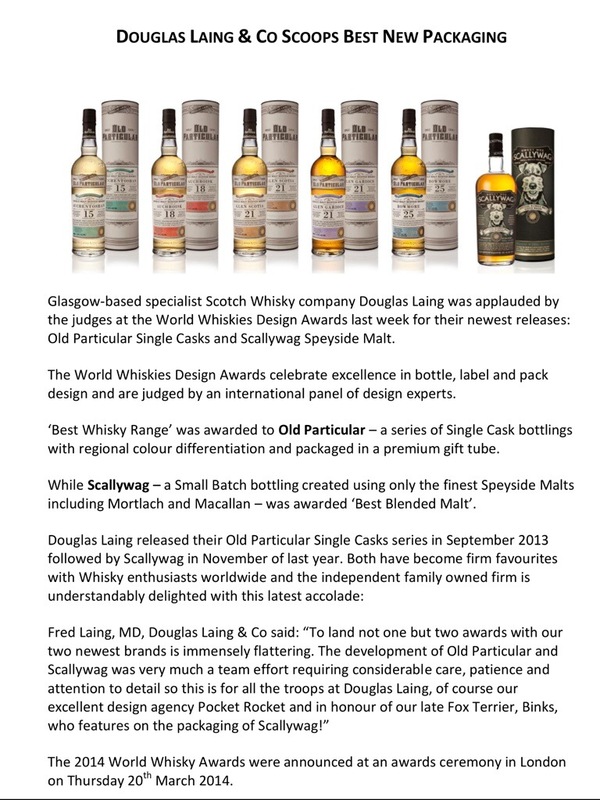 Knowing Douglas Laing bottlings I’m sure to be in for a treat. Going from the light ‘Chardonnay’ colour of this Whisky I’m assuming a refill bourbon barrel was used for maturation. 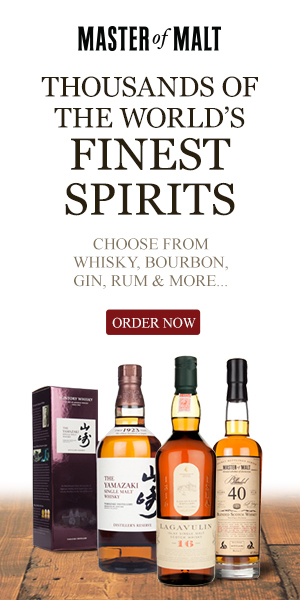 Addition: The sample I received for review was actually from the Japanese release, bottled at cask strength exclusively for the Japanese market. Powerful, zesty lemon, with some powdered sugar. The nose is actually warming, not in a nasal burn way but right down the nose pipes. Some floral flower beds. A little talcum powder. Tiniest little bit of smoke, I would say wood char rather than peat. So, plenty of citrus peel with a little squirt of juice. Hints of vanilla and pepper. Some light polish, showing its additional wood influence, but not overpowering at all. Sweet vanilla in the forefront. Development moves to Creamy buttery salted popcorn, then Chewy malt cereal. Very mouthcoating and oily, but delicate and that creaminess really spreads. Very light in the flavours, but that lightness is it’s charm and why I frakkin love Whisky so much, it’s so much different to anything I’ve tasted before. Exceptionally creamy, buttery palate. Medium-long finish starts with a little zesty lemon then it is all creamy, and melted butter. Gooey and pleasing. A little bit of floral oaky dryness at the very end. Some drops added and time past. The nose is zestier now, with more sweetie shop influence, added floral notes and more dusty oak. It’d say original nose amplified by a factor of 3. On the diluted palate there is definitely more flavour. The lemon juice and pith is now a feature and gives a tartiness to the initial taste. Still very creamy, but more custard and vanilla now in the development. The diluted finish is a tad longer, juicier, and drier at the end. The with or without water debate on this one is an easy win for water addition, but it does need to be experienced neat to get that awesome buttery cream pie palate. Another dram of two halves much like the Aultmore I reviewed earlier in that it’s so very different with or without water and both versions need to be experienced. This a lovely, fresh, tasty, creamy dram, which I’m thoroughly enjoying. With water it becomes another beast with a fruity, tarty zing of an edge which just enlivens the palate. 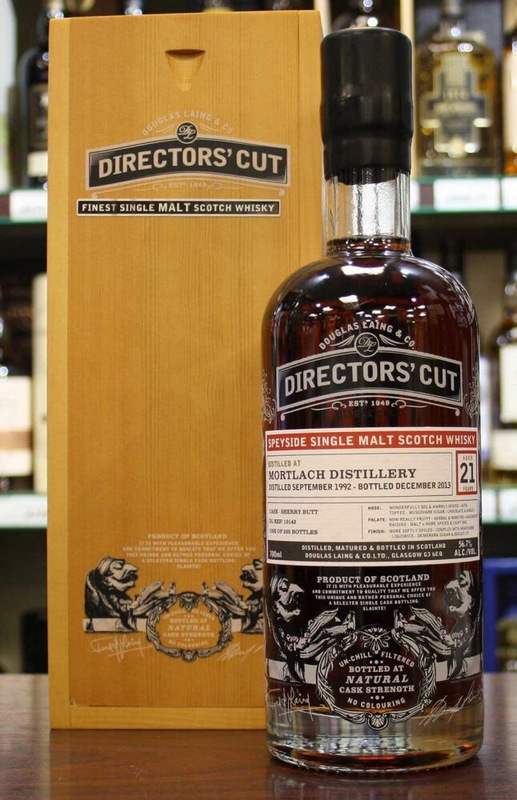 I’d say perfect aperitif or first dram for a Whisky tasting. Real tastebud opener. 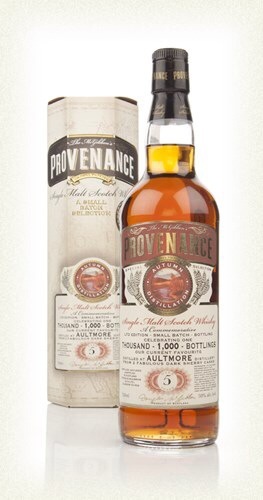 This, the 1000th bottling from Douglas Laing is a young Aultmore made up from maturation in 2 dark sherry casks. It has a lovely dark sherried colour to it despite it’s relatively young age. Can’t wait to taste. This is my first taste from the Aultmore distillery. Young sherried malt. There’s rich sherry there, but with all the youth of the original spirit very intact. Dried figs, raisin, raw fruitcake mix. A little time in the glass and the sherry asserts itself, with more familiar spicy notes coming forward amongst some seriously sweet sherry. Thick runny toffee. Sweet Cinnamon, pepper, nutmeg, walnuts, some nut oil coming through. The intense sherry is doing wonders for my salivating! Sweet and dry, with sherry and nuts going hand in hand. A little heat from the higher than usual ABV. Then we are back to a delicate taste, toffee and honey malt, fruit and nut chocolate, a little bit of stewed tea and mixed spice. This is all very mouthcoating as well, filling all the gaps with flavour. A nice dryness is pleasing in the late development. With some sour notes that exaggerate the sweet and give a very interesting beck and flow to the experience. The dried fruits and nut oil dominate the shortish finish, with some pepper spices, and a little oak to round things off. Very chest warming, and has a feelgood factor to this one. Small drop added. The nose is lighter now and more concentrated on the sweeter confectionary notes. Toffee & honey fudgery going on here, spices muted somewhat. The palate, lighter on the mouthfeel exhibits a similar reaction to water. Sweetness and toffee notes rule, the spices are still present in the taste but to a lesser punch. Now, at the moment I sound dissing of water addition, and I thought I was initially, but on further sips, I really do love the sweet shop toffee fudge that’s going on with the palate, it’s so very flavoursome and enjoyable. Damn, I was gng to say no water, but I quite like it with now, it’s like a different Whisky. The diluted finish is as with the diluted flavour, sweet and toffudgey (new word invented for this dram). It’s 2 and 1 whiskies. Without water i really like this young sherried Whisky, lots of flavour and enjoyment going on with a great thickness and feelgood. With water, I really like it also, but for more of a sweet treat of a dram. So, with or without water, well, you can choose based on your mood. Either way this dram is a real treat. Auburn with some red tints. Take your breath away pungent wood spice initially. Heavily polished oak. Wood shavings. This is big boisterous stuff. Getting through the oak, we get buckets of dark fruits. Cherries, ripe plums, raisins. Loads of dark sugar, burnt, caramelised and instantly chewy. There’s some menthol now, and the cherry more prominent, and as my friend Tom has said on his review, Cherry Tunes (it’s a cough/throaty lozenge, it’s stuck in my mind and it’s now up my nose!). With a little more time and air there is some cream sherry notes rising up. It’s a complex, big and beautiful nose. Sherry monster? Yeah, sort of, but far more refined and interesting with the aged oak notes. Instantly heart warming. Considering the strength the alcohol nip is minimal. The fruit is intense and thick as is the mouthfeel. There are dark cherries, spiced plums, some dark chocolate, more spicy dark fruits, I wouldn’t go as far as Christmas cake, but a heavily aged Christmas pudding overdosed on fruit and brandy. Luxuriously smooth, juicy and silky. Long, Warm and cosy. Sweet rich and deep dark fruits linger. Dark chocolate morphs into drying oak. I’m not convinced this one needs water at all, it’s so well flavoured undiluted, but I’ve put a small drop in what’s left of my dram. The nose is now more dusty oak focused, with less fruit on the front and more of that aged polished oak in a dusty library. The palate is a little more tart and cherry focused, with some tannins entering into the flavour. Finish is more mentholated, and another reminder of the cherry tunes lozenge. It’s still very excellent, but I would prefer the undiluted for the sheer unadulterated fruitiness and feel good factor. This is quality sherried beauty. Refined with age, and not a massive bruiser of a sherry monster, but more of a big sherried fluffy beastie, which is just plain lovely to huddle up to. I’m so pleased to be getting a share of this excellent Mortlach, and am now thinking about a bottle for sometime later. Hmmmm, awesome stuff. Lady of the Glen – Littlemill 21 year old. Very pungent lemon citrus. Sweet and sour at the same time. Some creamy vanilla custard notes. Light sawdust. With time in the glass the vanilla comes more forward and creamier, with some nutmeg, almost egg custard tart like with the lemon juice on the side. The next nosing I find more woody, with some older polish variation. A changing and enticing nose. A little more time and another nosing reveals more polished wood, and some spicy oakiness, pepper & cardamom, with a little more floral coming into the fray. Time to taste or I’ll be nosing all night. I’m getting some liquorice root and ginger now. Hot & sour. ABV nip gives way to chilli, peppers, ginger, then the creamy vanilla custard come through, more vanilla, here come the lemons, sweet though. With a smooth velvety coating mouthfeel. Short-medium, mellow considering the initial alcohol attack. Creamed lemons, boiled sweets, drying out light oak dust. A few drops added. The nose becomes lighter, less intense, but fresh and crisp. Some honey and creamy toffee is now evident, along with more floral notes. The lemon pie and custard is still there but a illite less intense. The palate is now more tart initially, still bursting with loads of now lemon juices, some oranges, sweet apples, toffee, so very creamy, actually getting more and more luscious with each sip. The finish is now slightly effervescent, slightly longer I would say, with continuation on all the flavour themes. With more water the toffee sweetness is up front, with the citrus relegated to the background. 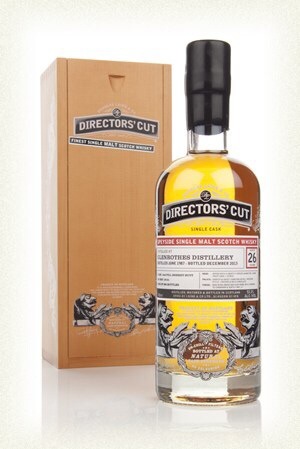 A varying, intriguing and complex nose leads to a monster of a palate, undiluted very flavoursome, a sweetie fan’s dram. With a little water this becomes a taste sensation. So much citrus, sweet and sour, juicy fruit bursting at the seams. Caramelised lemon tart with vanilla custard. Great thanks to Gregor Hannah from Lady of the Glen for providing a sample. 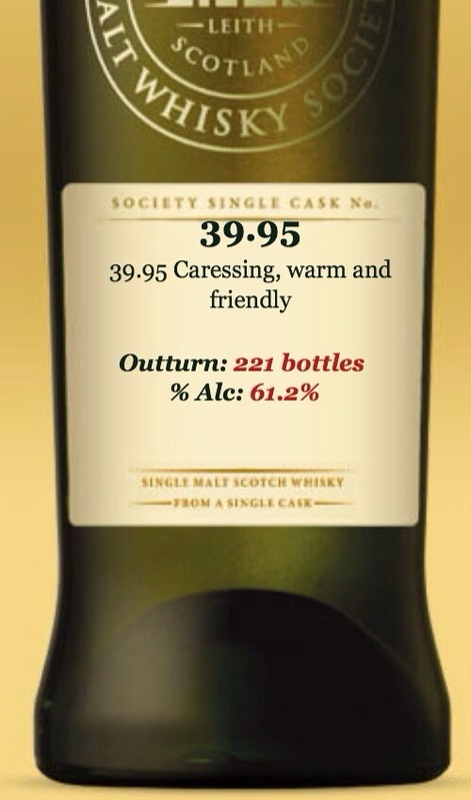 Whisky Review – The Wine Society Islay 25 year old single malt. 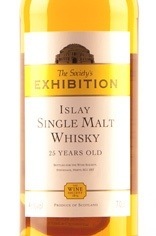 The Wine Society Islay 25 year old single malt. Light smoke. Iodine. Tiny amount of medicinal peat. The nose is inundated with large amounts of stewed fruit. Pears, melon, caramelised apple tart, sweet gooseberry jam, pineapple. The fruit is very thick and luscious. Minimal vanilla spices. Some oak, but considering its age it has lots of youthfulness in a very good way. Sweet, clean, fresh and Intensely fruity. All the stewed, jammy fruit nosing notes translate to the palate. The Islay smokey profile is more prominent on the tongue, with some crisp iodine and sea airy notes. The age is evident from the lack of ABV burn. Medium-long, warm, chest hugging. Sweet, fruity juicy continuation, some sea air, a little peat, after a while dryness comes forward with a little oakiness. A small drop added, which has brought some cloudiness indicating non chill filtration, shame this isn’t mentioned on the bottle. More fruit is now present on the nose with some increased tropical fruits, almost um bongo in nature. The palate is now a little lighter in viscosity, but still retains an incredible amount of fruit and fruit juices. The peat influences on the palate are reduces a little but intensified on the finish, which now displays those medicinal peat, iodine, sea air notes. 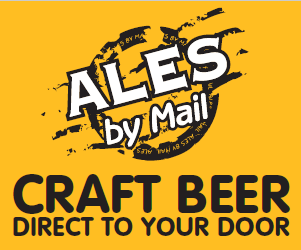 With a drying, crisp and moreish final finish, whilst being fruity all the way through. It’s bloody tasty. I wouldn’t say this exhibits it’s age well, but that’s not a bad thing, it’s retained youthfulness and is full of flavour. An immensely fruity dram. So very tasty and easy drinking. The Islay peat notes have diminished with age, so I wouldn’t described this as a peat monster, but a well aged peaty Whisky. There is so much fruit variation, juiciness and general drink ability I’m finding this quite hard to put down. This is the first Whisky I have bought with my wine society membership, and I feel I have made the right choice in joining, and am looking forward to trying more as and when they are released. The nose, fresh and attractively youthful, tumbled aromatic antics of vanilla, gorse flowers, sandalwood, scented candles and melon, plus plentiful sweet suggestions (stroop waffles, toffee ice-cream, lemon puffs, Edinburgh Rock, white chocolate). The palate also provided intense sweetness in the form of butterscotch, brown sugar, toasted marshmallows and custard creams; but we also found marmalade and black tea bitterness, white pepper, orange blossoms and ‘licking a new stave’. Still refreshing, the reduced nose conveyed pot-pourri, icing sugar, nougat and pancakes with lemon and honey. The palate now seduced us with its caressing sweetness and friendly warmth. From the east Elgin emporium. Fresh, floral, lots of zingy citrus fruits. Orange, lemon, lime, sour apple. Creamy barley sugar sweetness. Some light wood shavings. The nose is quite alcohol potent so don’t dip your nose in too deep. Vanilla. Time in the glass and more icing sugar, confectionary, and a little bit of rum intensity. Some burnt sugars, caramel and toffee are also coming through with a little more air and patience. Fascinating, varying nose. ABV popping, but all the time there is a lovely sweet and sour going on, lots of citrus and oakiness. Some effervescence mid development. Mouth watering through the ABV tingles, fades to more creamy vanilla custard and honey. Shortish-medium. Creamy then drying oak, fizzy vanilla sherbert, then sweet again with some intense sweetness of barley sugar/honey/brown sugar. Added a good few drops, probably a teaspoons worth. The nose has more floral oaky notes now. But in no way overpowers the plentiful citrus (orange & lemon dominate) oils and peel. If anything it’s more intense. Something medicinal now, lozenge like. The palate is now sweeter with still the lemon bitter zing, but to less effect. 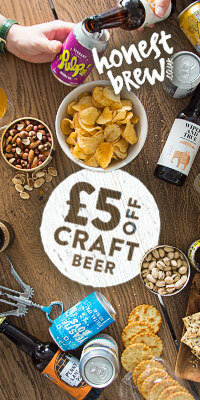 Much more honey, vanilla sweetness, lighter sugars, buckets of barley sugars, chewy vanilla toffee, lemon sherberts, really mountains of flavoursome sweet shops. The finish has long longer with some prolonged juiciness, sweet shops, drying out with some light oak tannins, and a little sherbert dib dabs. The lemon sweeties stay around for ages. Still tasting them after some 15 minutes after my last drop. Added some more water, 5 drops or so. The nose now has a lot more floral and the citrus has taken a back step. The palate is much lighter, less intensive, still very flavoursome, but lacking some of the balance in the sugar vs the citrus, with the sugars taken the forefront now with less juicy intensity to the citrus. The finish now concentrates more on the floral oak side of things. This dram with a little water is superb, with too much it can loose that special something. This Linkwood is full of surprises, lots of variation. A very explorable, changing nose. When diluted an explosive flavoursome palate. Really memorable and one I want to revisit.